Tech jobs are some of the hottest in the country. And the increasingly available opportunities to work in tech deliver high salaries, to boot. But because some of the traditional tech hubs are clustered in the cities with the highest cost of living, like New York or San Francisco, that tech pay may not always go so far. There are, however, plenty of nontraditional tech cities where pay is still high and where workers don’t need to worry about whether or not they can afford their mortgage. Below we look at five different factors to rank the best cities to work in tech in America. Specifically, we look at data for 190 cities and compare them across metrics like average salary, average cost of living, tech employment concentration, unemployment rate and ratio of average pay-to-tech pay. Check out our data and methodology below to see where we got our data and how we put it together to create our final rankings. This is SmartAsset’s fifth annual study of the best cities to work in tech. Check out the 2017 version of the study here. San Francisco is overrated – For tech workers who want to have the most financially secure future, it is probably best to avoid San Francisco. The cost of living in San Francisco is about twice the national average and the unemployment rate for bachelor’s degree-holders is fairly high. However if you are just trying to land a job in tech, and aren’t worried about saving, San Francisco is a good place to look. More than 8% of all workers in San Francisco are employed in tech. Avoid the Northeast – Cities in the Northeast tend to have slightly high unemployment rates and elevated costs of living. The only Northeast city in our top 30 is Wilmington, Delaware. Ohio’s capital takes the top spot as the best city to work in tech. You may see Columbus, Ohio and not think of it as a tech worker’s paradise but the data suggests otherwise. Columbus has plenty of tech jobs, over 4% of all workers are employed in tech here, and the average tech worker takes home a salary of over $91,100 per year. In both of those metrics Columbus ranks in the top 25. Columbus is also more affordable than many cities as well. Columbus is about 10% cheaper than the rest of the country on average. Another plus to living in Columbus and working in tech is that you will likely be at the top of the local income ladder. The average tech worker earns more than 1.8 times what the average worker earns. For tech workers looking for stable, secure job opportunities, Des Moines, Iowa is a fantastic city. More than 4% of workers in Des Moines work in tech. Another plus for tech workers is the low unemployment rate. Holders of bachelor’s degrees have an unemployment rate of 2.3% here, according to Census Bureau estimates. Perhaps the only major concern for tech workers here is that their pay is not that high compared to the metro wide average. The average tech worker makes only 64% more than the average worker, an average score. Dallas is the place to be in this top 10 for high-paying tech jobs. BLS data reveals that nearly 1 in 20 workers in Dallas is employed in the tech industry. On average they earn nearly $93,000 per year, the second most in our top 10. So why isn’t Dallas any higher? Unemployment for college graduates is slightly high by the standards of this study. Dallas ranks 92nd in unemployment rate for bachelor’s degree holders. Cedar Rapids is the second Iowa city in this top 10. 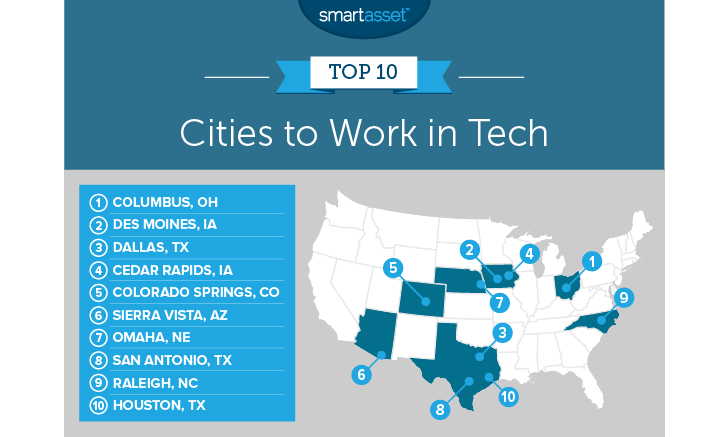 Primarily, Cedar Rapids claimed a top 10 spot due to its bountiful tech job market. Just under 4.3% of all workers here are employed in tech and only 1.8% of bachelor’s degree holders are unemployed. In both of those metrics Cedar Rapids ranks in the top 25. Those are this city’s best scores but Cedar Rapids also ranks no worse than average in any metric. If you work in tech in Colorado Springs you are probably one of the highest paid people in the city. 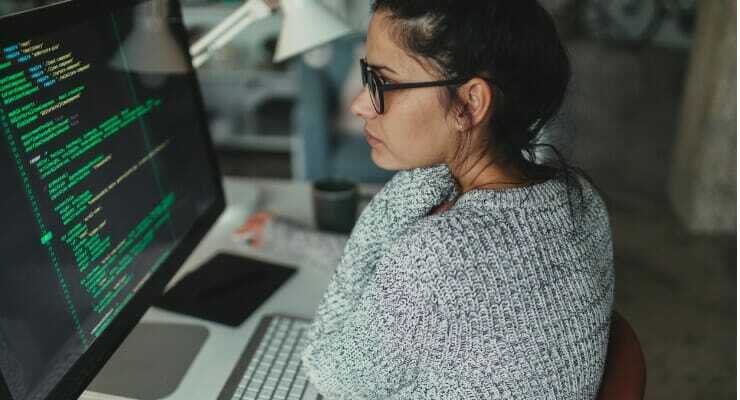 BLS data shows that the average tech worker, who earns $94,400 per year, earns 89% more than the average worker. 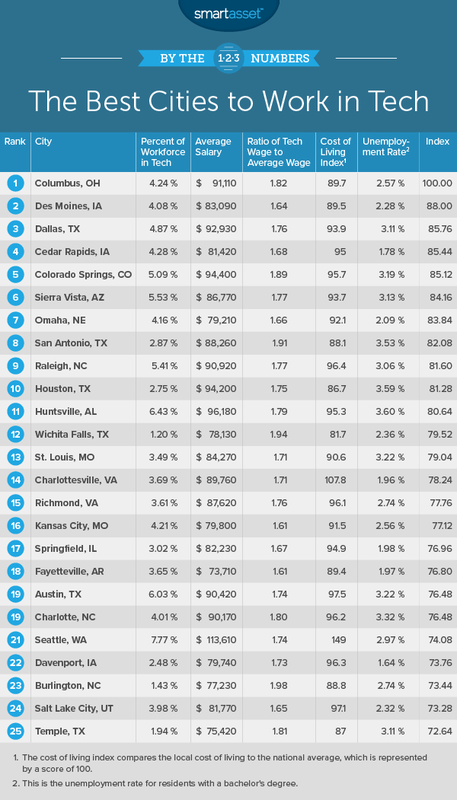 Overall, tech workers here are paid a top 20 rate compared to other cities in this study. If you do move to Colorado Springs you will probably want one of the high-paying tech jobs. This city ranks in the bottom half for cost of living. Sierra Vista is the best place to work in tech in Arizona. This city is chock-full of tech jobs. According to our data, about 1,800 of the 32,000 workers in Sierra Vista are employed in tech. The cost of living here (93.7) is slightly high for our top 10 but tech pay in Sierra Vista should make up for it. According to BLS estimates, the average tech worker here earns $87,000 per year. That’s 77% more than the average Sierra Vista worker. If you’re in Nebraska and looking for a job in tech, the data suggests your best bet is to head to Omaha. Tech workers will appreciate the good balance Omaha offers. This city ranks lower than 68 in any metric in our study. Only Columbus and Des Moines rank better than 68 in every metric. Omaha’s best score is in percent of workers employed in tech. BLS data shows that nearly 4.2% of workers in Omaha work in tech. San Antonio, Texas takes the eighth spot. There are not too many tech jobs in San Antonio but the ones that do exist are extremely well-paying relative to other jobs in the area. The average tech worker earns $88,260 per year, which is 91% more than the average worker. Another benefit to being a tech worker here is the low cost of living. San Antonio runs about 12% cheaper than the national average. So if you are moving to San Antonio to work in tech, there may not be plenty of jobs available. Yet if you can land one of them, it will definitely be worth your while. Raleigh tech workers are some of the highest earning in the country. According to our research the average tech worker in Raleigh takes home about $91,000 per year. That means Raleigh tech workers earn about 77% more than the average Raleigh worker. Tech workers also have plenty of options when it comes to employment. Our analysis of BLS data shows 5.4% of all workers are in the tech space. Last but not least is Houston, Texas. Working in tech here means a high salary. In fact, the BLS estimates the average tech worker in Houston earns over $94,200 per year. That is 75% more than the average Houston worker. One concern, though, if you live in Houston: a bachelor’s degree is no guarantee of employment. Around 3.6% of residents with bachelor’s degrees are unemployed. Percent employed in tech. This is the percent of all workers who work in computer and mathematical occupations. Data comes from the Bureau of Labor Statistics and is for 2017. Average tech salary. This is the mean annual income for workers in computer and mathematical occupations. Data comes from the Bureau of Labor Statistics and is for 2017. Ratio of the average tech salary to the average salary across all fields. Data comes from the Bureau of Labor Statistics’ May 2017 Occupation Employment Statistics tables. Unemployment rate. This is the unemployment rate for holders of bachelor’s degrees. Data comes from the Census Bureau’s 2016 5-Year American Community Survey. Cost of living. Data comes from the Council for Community and Economic Research and is for 2017. To create our final ranking we first found each city’s average ranking, giving an equal weight to each metric. Using this average ranking, we assigned a score to each city. The city with the best average ranking received a 100. The city with the lowest average ranking received a 0. Consider renting first – When you first move to a place take your time before you buy a home. Renting may feel like a waste of money, but it gives you flexibility that buying doesn’t. If you are not sure how long you will be in a city it can actually make financial sense to be a renter. Buying a house over a short time span means paying a bunch of upfront costs like closing costs that can wipe out any gains in home value between buying and selling data. SmartAsset’s rent vs. buy calculator can help you with the math to see what makes sense for you. Don’t go overboard on the mortgage – If you are a first-time homebuyer doing the math on how much house you can afford, you may be overestimating if you ignore some of the extra costs that come with owning a home. For example, don’t forget about property taxes. Homeowners pay property taxes which vary in size form state to state. Average property taxes in New Jersey and average property taxes in Illinois are some of the most expensive in the country, for instance. So if you do live in those states, make sure you are factoring property taxes so you know how much home you can afford. Get an expert’s opinion – Your home is likely the biggest purchase you will make in your life, so why take any risks. By getting the opinion of a financial expert you can be sure that when you buy your home it is for the right reasons. If you are not sure where to find one, check out SmartAsset’s financial advisor matching tool. It will match you with up to three local financial advisors who fit your specific needs.